The Korean danhobak is a kind of winter squash, known by its Japanese name kabocha in English. In Korean, dan means “sweet,” and hobak means “pumpkin,” and bap means “rice,” so you could translate this dish as “sweet pumpkin rice.” A danhobak is very sweet and fluffy when cooked, so I often steam it and eat it by itself. The texture is very similar to sweet potato. There are 2 ways to prepare danhobakbap. The first way is to mix rice with chunks of kabocha in a pot, and serve with a seasoning sauce called yangnyeomjang. 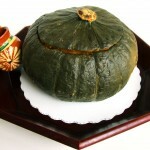 The second way is to scoop out the insides of the kabocha, fill it with rice and other ingredients, and cook it. I’m introducing the second version to you today because Halloween is coming soon, so I think you might be interested in making this beautiful and delicious danhobakbap with the kabocha pumpkin intact. If you take danhobakbap to your party, it will be popular because your friends will be excited to open the lid to see the colorful delicious looking rice inside! Kabocha (1½ kilograms, or about 3 pounds), sweet rice, black sweet rice, salt, jujubes, pine nuts, raisins, canned chestnuts, soy sauce, vinegar, green onion, green peas, and red chili pepper. Let’s make the rice first! Place 1 cup of sweet rice and 2 tbs of black sweet rice in a small pot. Add some water to the rice and scrub it by hand a couple of times. Rinse, and then drain the water. Repeat until the rice is clean and the drained water is mostly clear. Add 1 cup of water and a pinch of salt to the rice and close the lid. Set aside to soak for at least 30 minutes. After soaking, bring to a boil over medium high heat for about 5-6 minutes. Open the lid and simmer over low heat with the lid closed for 10 minutes. Add ⅓ cup of green peas to the hot rice and mix it up. Set aside. Cut off the top to make the lid just like a jack o’ lantern. Scoop out the insides and set aside. Remove the pits from 8 dried jujubes. Measure 2 tbs raisins, 2 tbs pine nuts with the tips removed, and ½ cup canned chestnuts, and set aside. 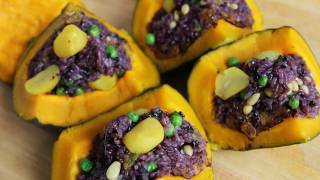 Place the jujubes on the bottom of the kabocha and add the cooked rice, the raisins, and the pine nuts, in that order. Add more rice on top to fill it out. Open a can of chestnuts and place them over top of the rice. Put the lid back on the danhobak and steam or boil for 30-40 minutes until it’s cooked thoroughly. Wrap it in cheesecloth beforehand so you can easily take it out when it’s ready. Make sauce by mixing 3 tbs soy sauce, 2 ts vinegar, 1 tbs chopped green onion, and 1 ts red chili pepper in a bowl. Open the lid of the kabocha and cut it into 4 pieces with a knife. Transfer each piece to a plate and serve with the sauce. Posted on Monday, October 17th, 2011 at 9:36 am. Last updated on October 5, 2014. Posted August 6th, 2017 at 1:44 pm | Log in to reply. Posted June 3rd, 2015 at 2:22 am | Log in to reply. just saw this and it looks beautiful! 1. is it water chestnuts? or can i use water chestnuts? 2. i can only find chestnuts in a bag called “roasted chestnuts” or in a jar, and there is no water in it. can i use that instead? i would love to make this soon! Posted June 4th, 2015 at 8:21 pm | Log in to reply. 2. Roasted chestnuts could be used if you want. Posted August 25th, 2012 at 12:36 am | Log in to reply. The danhobakbap presentation is very attractive. I would also like to know about your 1st recipe which is mix rice with chunks of kabocha in a pot, and serve with a seasoning sauce called yangnyeomjang. Where can I see this recipe? Can I use rice cooker to cook this 1st recipe and the sweet rice for the 2nd recipe? If can, how much water should I use when using rice cooker? Is there anything that I can replace the chestnut? Posted February 16th, 2012 at 9:23 pm | Log in to reply. I have a question, you see I don’t like pumpkin very much, so I don’t want to buy a whole squash over here they sell them pretty big and is just 3 people in my house and I really want to make this. Is there a way to make the rice with raisins,chestnuts(I love Chestnuts) with everything you put in it, but with out the squash??? Posted February 17th, 2012 at 9:22 am | Log in to reply. This recipe was originally posted on October 17, 2011 at 9:36 am by Maangchi. It was last updated on October 5, 2014. The video was watched 235,190 times on YouTube & has 2,447 likes!